In this Expositor Podcast, Dr. Steven J. Lawson breaks down in detail how best to craft an expository sermon. 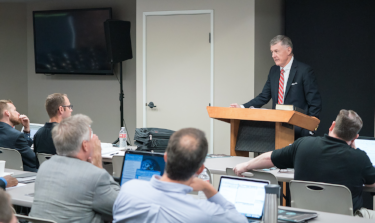 In this Expositor Podcast, Dr. Steven J. Lawson expounds on eight reasons why he believes the expositor should include preaching whole books of the bible in his toolbelt. As 2016 is now behind us, we at OnePassion Ministries are excited for what lies ahead in the year 2017. By the grace of God, we are poised to enter into the greatest season of ministry in the work to which He has called us that we have yet known. As you are undoubtedly aware, this year marks the 500 year anniversary of the posting of the 95 Theses by Martin Luther on the front door of the Castle Church Wittenberg, Germany. This bold stance ignited the Protestant Reformation, and the aftereffects of this powerful movement still reverberate around the world. With this history-altering era in mind, much of 2017 will focus around this extraordinary event that has lasting effect until this present hour. We will be hosting many conferences for training pastors, elders, Bible teachers, and men in the ministry of expository preaching. These sites stretch from coast-to-coast including venues in Oklahoma City, Washington DC, Atlanta, Chattanooga, St. Louis, and Columbus, Ohio. Other sites are being currently considered and will be added to our schedule. Further, other places overseas will host our conferences, including Northern Ireland, Ireland, New Zealand, the Philippines, Nairobi, Zambia, Kenya, the Dominican Republic, and other countries yet to be announced. As you can see, our onsite outreach at OnePassion spans not only across our country, but around the world. In this upcoming year, all six issues of our Expositor magazine will be focused upon the recovery of biblical preaching that took place in the sixteenth century Reformation. Each successive issue in 2017 will address the pre-Reformation, German Reformation, Swiss Reformation, English Reformation, Scottish Reformation, and finally, the legacy of the Reformation. There will contributions in each issue by noted pastors, authors, and theologians such as John MacArthur, Edwin Lutzer, Michael Reeves, Michael Hoykin, and a host of other imminent leaders. In surveying the pulpit of the Reformers, we will center our attention upon past stalwarts such as John Wycliffe, John Hus, Martin Luther, John Calvin, the Marian martyrs, and John Knox. I am confident that this will be our greatest year in producing Expositor magazine. If you are not already a subscriber to this excellent publication, I would urge you to visit our website and purchase a subscription today. Whether you are a preacher, teacher, or one who loves sitting under the ministry of the word, you will not want to miss a single issue. Each issue will focus upon the Reformation and will have a great impact upon your spiritual life. In this upcoming year, we will be posting new recordings of our Expositor Podcast. In these six to eight minute podcasts, I cover a practical aspect of expository preaching. We have already recorded many of these podcasts for 2017, and they will soon be posted on our OnePassion website. You can also access these podcasts on our OnePassion app without charge. Also, we will be posting our Following Christ podcasts in which different sermons that I preach during my travels will be featured for further listening. These podcasts will be a great help to your spiritual life as they bring the preaching of the word of God to strengthen your life. You may access these on the OnePassion website or our OnePassion app. As you can see, we are excited for what lies ahead in this upcoming year. We want you to stay closely connected to us so that we may have the privilege of ministering to you on a regular basis. As the Lord leads you, please consider supporting our work financially at OnePassion Ministries. There is so much more that we want to be doing, but we can only do so as the Lord provides the means. By your gifts, you will be strategically used byGod to help fulfill the work that He has entrusted to us. I am not aware of another ministry that accomplishes so much with so little. Our overhead and expenses are extremely low, but our outreach is far and wide – literally around the world. Please stand with us as we try to reach the world for Jesus Christ. For every pastor we reach, we are impacting large numbers of those who sit under their preaching. May this upcoming year be the greatest year in your Christian life as you follow Jesus Christ wherever He leads you. We at One Passion Ministries have been praying without ceasing for this season in which our nation finds itself. Dr. Steve Lawson has prepared a short video in which he shares his heart for our land, giving insight into how we can walk out this election season stronger in faith, hope and love for Christ. God bless you in this important period. The month of September has been the busiest month yet for us at OnePassion Ministries. Though extremely busy, I am thankful to the Lord for this because it indicates many open doors that lay before us. I continue to be thankful for the many doors that God opens for the preaching of the word of God and for training men for this calling. This past July has been filled with many such opportunities.